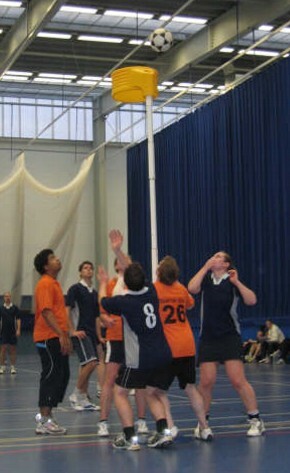 Korfball is one of the world's only mixed team sports. As such, it has a unique social dimension. It takes just a few minutes to learn, but for those who take it seriously, a lifetime to perfect. It is fast, dynamic and a challenging aerobic workout, accessible to both young and old(ish! ), complete beginner or international. While it values co-operation within the team, it can also be highly competitive. Like many other sports, it was first developed for school children in the case of korfball in Amsterdam in 1902, as a variation of basketball, adapted so both boys and girls could play equally within the same team. It's been played in the UK since 1946. 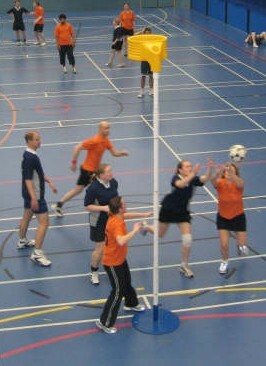 Korfball is played by two teams of 8 (4 men, 4 women). The object of the game is to elude your personal opponent to shoot the ball through a korf (the Dutch word for basket) that, for adults, sits on a 3.5m post. The posts are several metres in front of the ends of the court to enable shots from 360 degrees, and after two goals are scored, defenders and attackers switch roles, meaning everyone experiences the glory job of attempting to score as well as the grunt work of preventing it. Korfball has specific individual skills and techniques that have evolved over more than a century around passing, shooting and assisting a team mate to acquire space. Competence in these is important, as are speed and athletic ability. Unlike most other team sports, korfball generally does not assign rigid pre-determined roles to each player within the team encouraging all players to learn a variety of roles rather than specialising. If your still a little confused then try watching a video of the game here.